Dog Bites G.O.A.T – It’s the #DoubleFML Super Bowl After Party! – #DoubleFML FatDarrellPalooza! Dog Bites G.O.A.T – It’s the #DoubleFML Super Bowl After Party! True Story! Oh yeah, and let’s also take a closer look a that shirt from the cover photos, shall we? I didn’t actually go to Polk High. I’m proud to represent the mighty Lions of Middletown High School North in New Jersey! But if you were a fan of the popular hit 90’s sitcom Married…With Children, you might recognize this jersey. Tom Brady is great and all, but I’ll tell you what – Al Bundy would have caught that pass! Anyway, what’s up everybody? Welcome back to #DoubleFML! Hopefully that groundhog shadow tradition is wrong because I’m definitely looking forward to this cold weather disappearing soon! Why are we relying on chubby rodents to provide us with the weather forecast anyway? I’ll have to look up the origins of this strange tradition when I have more time later. While we’re on the subject of Groundhog’s Day, have you ever experienced Déjà vu? That’s the feeling that the situation currently being experienced has already been experienced in the past… as though you’ve lived through it already. I’ve had it happen a few times, it’s always a strange feeling. Has that ever happened to you? Comment below! I didn’t make this up! They really should make the day after the Super Bowl a national holiday though! Half of the office is usually either hungover or moving in slow motion from being tired the next day anyway. We might as well just go ahead and make it official! Just kidding folks! Realistically, there may have been a decent amount of people who voluntarily missed the game because we just wrapped up one of the most politically influenced and divisive NFL seasons of all time! So, it was only fitting that the championship game came down to The Eagles vs. The Patriots. I mean, it really doesn’t get any more “American” than an eagle and a patriot! Unless they named a team “The Deadlocked Congress” or “The Crappy Health Care Premiums” or something. I’m not sure if that last one would fit across a jersey though…but the mascot and logo would sure be interesting! A family trying to decide which symptoms they’re willing to deal with since they can’t afford prescriptions for all their “pre-existing conditions” perhaps? Go Team! Speaking of prescription drugs, let’s hope this meme is wrong because the last 4 digits of my number are 9999! But yes, the Underdog Philadelphia Eagles pulled off the big win over arguably the greatest of all time (ie: The G.O.A.T) Tom Brady and The New England Patriots in a thriller! The game had back and forth action, trick plays and went wire to wire. I was literally on the edge of my seat for most of the game! Granted, that was partially due to my spread of snacks being on the coffee table in front of me…but still, great game! Congratulations to both teams on an amazing season though. And while I went into the game thinking that New England would ultimately win, my heart was still with Philly since I used to work for the team’s Marketing Department back in the day (*I’m a 49ers fan so either outcome was fine with me). With that said, I couldn’t be happier for my former employers. They finally won the big game! Fans have been waiting so long for this to happen and they honestly deserve it. That’s definitely one passionate fan base! For those who are unfamiliar, this is the same group of fans who once booed and threw snowballs at Santa Claus! They also used to have a courtroom and a jail underneath their old stadium since so many fights and incidents took place during the games! During my time working there, we once had to deliver items to selected rows for Fan Appreciation Day. I somehow got stuck with bringing coupons for a free McDonald’s meal to the 700’s section! If you know anything about sports, the 700’s (aka nose-bleed) section is where the most rabid fans of all can be found! I swear I had so many people clawing at me for those coupons that I finally just tossed the entire stack into the air and let them fight amongst themselves for them as I retreated back to the office! But McMuffin-induced violence aside, isn’t that what you want from your fan base? Passionate and loyal? So yeah, Eagles fans are pretty wild, but this is the place where Rocky Balboa was born and raised. Scrappiness, grit and a determined, fighting spirit are what this historic city is best known for! Well, that and cheesesteaks. Mmm…cheesesteaks. Sorry, I distracted myself. Where was I? Oh yeah, Eagles fans. Did you see this meme that went around saying that win or lose, Philadelphia fans would burn the city to the ground? It was obviously meant to be a joke online however I know that many residents were offended by this picture. Even city officials took offense and challenged the citizens to defy the stereotype and show the rest of the world that “The City of Brotherly Love” isn’t full of a bunch of savages! Instead, they challenged everyone to celebrate the team with class and pride and prove everyone wrong! And Patriots? Hopefully my beloved 49ers will see you in the Super Bowl (here in Atlanta!) next year! Yep, there I go making bold predictions again! If you’ve been paying attention, that didn’t go so well for me this past Sunday! Yes, it takes a strong man to admit when he’s wrong and boy was I way off on my bets! First of all, I said that The Patriots would win and that obviously didn’t happen. I also said that Justin Timberlake would bring out both N’Sync and Janet Jackson as surprise guests for his halftime show performance and again, I was wrong on both counts. The only bet that I managed to win was that I’d end up in a food induced coma before the end of the first quarter but honestly, that’s a safe bet every game. While we’re on the subject of that halftime show though, what did you think? I’ve been hearing a lot of mixed reviews which actually surprised me! I’m somewhat biased since I’m a big Justin Timberlake fan, but I thought he did a great job! Some of the complaints that I’ve heard were that he didn’t bring out any guests to perform with him. That actually surprised me too…which is why I lost those bets! After the controversial performance with Janet Jackson where she had her infamous “wardrobe malfunction” and exposed her “Miss Jackson if you’re Nasty” to all of the world, everyone fully expected her to make an appearance and bring things full circle! My guess is that after all of the clamoring for her to make an appearance, the NFL will reach out to her to perform next year. Yep, there I go making bets again! I’m thinking that next year it will either be Janet Jackson or Taylor Swift (or possibly Jay-Z who turned it down this year). But if you’ve learned anything from my last predictions, you’ll know that I’m probably wrong! Either way, NostraDarrell has spoken. We’ll see how it plays out next year! Another major complaint that I heard about Justin Timberlake’s performance was that he wasn’t Bruno Mars which is a little unfair. I mean, who aside from Bruno Mars can be Bruno Mars? Don’t get me wrong, I’m also a big fan of his work! Bruno’s an incredible performer but where did this rumor come from that he was going to be on stage too? Did I miss something? He’s been in 2 of the last 4 Super Bowls! Geez, he can’t do it every year. It’s not a Vegas residency! But yes, he is great. The third main complaint that people had about the halftime performance was the Prince tribute. As a longtime Prince fan, I honestly wasn’t offended by that since the game was held in Minneapolis so it seemed like a natural homage. Ironically, Bruno Mars may have been the only one who could have pulled that off without controversy though because his Grammy tribute to Prince last year was chilling. If you haven’t watched that yet, look it up, it was incredible and really did the purple one justice. I still thought that Justin did an admirable job though and having the entire city light up to form a giant Prince logo was incredible (although I just read that it was only a digital TV effect so locals who ran to their windows looking for this in real life like I would have ended up being disappointed)! I also thought that he made better use of the entire stadium than any performer I’d ever seen, including the crowd, but to each his own I suppose. This outfit makes my pancake tank top actually look fashionable! Oh yeah, and Justin was also blasted for his wardrobe selection but if you’ve seen some of the crazy outfits I’ve worn for this blog, you’ll know that I’m clearly not one to have a right to comment on fashion! Regardless of what you thought about halftime, I’m sure we can all agree that Pink absolutely nailed The National Anthem. Wow! She was incredible! After the performance she even admitted that she was battling the flu! I currently have a clean bill of health and still couldn’t sing like that! As for the commercials, recent years have paled in comparison to the past and I think it’s partially due to them being released online first now. It really does spoil the surprise. With that said, a few of my favorites were the Amazon commercial featuring Cardi B, Rebel Wilson and Gordan Ramsay as the voice of Alexa! That might have been my favorite of the night had I not seen it online nearly a full week earlier. I thought that Tide’s spoofing of other commercials was hilarious and a great way to capitalize on all of the exposure from the Tide Pods craze. I thought the Danny Devito M&M’s commercial was clever and seeing Morgan Freeman rap like Missy Elliot was definitely memorable! Since I love the “Dilly Dilly” commercials, I may have raised my expectations a bit too high for Bud Light’s entry. I was a little disappointed with their commercials this year. And did I miss the Clydesdales? They weren’t prominently featured last year either. What’s up with that? It’s possible that I missed it though because it’s always tricky trying to decide whether to take my bathroom break during the game or during the commercials on Super Bowl Sunday! It’s even worse when I actually want to watch the halftime act too! As for the night’s winner for best commercial? That easily goes to the NFL’s clip featuring members of the New York Giants reenacting the iconic dance scene from Dirty Dancing! I’m really hoping that they actually do this in the end zone next season at least once! Oh yeah, they also had this unheralded commercial for Toyo Tires that you might not have even noticed. During the commercial, they used the analogy that putting horrible tires on a great car would be like putting squeezable cheese from a can on a perfectly cooked steak. They then proceeded to show the cheese being squeezed onto the steak which was supposed to gross viewers out but hmm…they might be on to something with that one! I might actually give that a try so um yeah, thanks Toyo! What was your favorite commercial or moment from Super Bowl 52? Comment below! Unfortunately, that was the last NFL game of the season and thus begins the great famine of 2018. That’s the time that I refer to between the end of the Super Bowl and the beginning of the next season in September. Of course, this year’s great famine will be a bit more tolerable than the last few have been. First of all, my favorite teams in other sports have improved to the point that Lakers games aren’t insufferable anymore and The Yankees are one of the early favorites to win The World Series! The Winter Olympics also begin on Friday! I always love watching The Olympics so I’m definitely looking forward to that! We can discuss all of that once the games officially begin but what events are you most looking forward to? Comment below! You see, part of my gig was to run through sound checks with the talent and handle VIP’s. Although it’s hard to see, if you enlarge the photo enough, perhaps you’ll notice the hearts in my eyes because I was definitely crushing on her! My co-worker said that it was mutual and that I had a shot but alas, I was too big of a coward to ask her out. Instead, I drowned my sorrows in cheesesteaks and hot chocolate as I annoying whined about “the one that got away” for the rest of the game after we finally went our separate ways. Where I’ll probably be sleeping for the next few weeks after that story! Oh yeah, and speaking of sleeping on the couch, fellas, here’s yet another reminder that Valentine’s Day is next week so you’re quickly running out of shopping days! Don’t say I didn’t warn you. You’re welcome. Do you have a fitness question or accomplishment you’d like to share? Tell us about it in the comments below! Do you have another song that fits today’s themes? Do you have a song that doesn’t fit today’s themes but is just so great that we should check it out anyway? Tell us about it in the comments below! Before we go, quick update! Long time readers might remember when I mentioned scaring away that creepy ice cream man who’s been coming around all winter. Well he returned on Super Bowl Sunday! It may have just been for the special event but if he starts coming around again each day, I’ll have to finally investigate! It’s still 30 something degrees outside (for at least 6 more weeks according to that groundhog)! It makes no sense unless he’s serving hot chocolate and coffee too? Anyway, here’s the part where I remind you to follow me on social media by clicking the icons on the side panel. Oh yeah, and if you’re on Facebook, make sure to join my foodie group, Phenomnomnomenal, by clicking here. And of course, you already know to leave a comment before you go! Last but not least, check out our #DoubleFML Deals and Discounts page for some exciting discount offers we’ve set up for you guys! Okay, well that about does it for this week. Thanks again for dropping by! That’s actually AWESOME! Definitely much more productive than eating pizza until you can’t move and falling asleep on the couch like I did! “How ’bout them Eagles?” lol I still can’t believe that they beat Brady and company!!! WOW, what a game! Now that the season is over, I join in your sadness in your video. I don’t know what I am going to do now, but I better start supporting my favorite basketball team! Thanks for this great post!!. Yeah, it was a close game but The Eagles played really well! Great game! But yes, now the great famine is upon us. The NBA will help some though plus The Olympics are coming up! Thanks for commenting! Love that Al Bundy T-shirt!! Man, I really enjoyed watching the Married… with Children tv show!. Glad you cleaned up your act in talking about your big crush on 90’s pop singer Debelah Morgan while you were working with the Philadelphia Eagles. Else you might get in trouble with your girlfriend. haha. Just mentioning the Eagles immediately took my mind to their big win on Sunday. “Under dogs, they are not” Go Eagles!!!!. Ha, yeah I used to love Married with Children! Great show lol. And yes, so far I’m still allowed to sleep in the bed so either my gf hasn’t read this one yet or she’s giving me a pass! Either way, I’m not complaining! Thanks for making me laugh in the post!! Happy birthday Beth meme really cracked me up. lol You actually worked for the Eagles? Wow, you have been around, haven’t you? haha I love that team along with two others I will not mention right now. You know what? I am still trying to figure out my favorite commercials on Sunday…. You came up with some really great ones! That cake meme was funny!. ..and true! Yes, I used to work for The Eagles too. I miss that gig…even though I’m actually a 49ers fan! Hopefully they’ll be in the big game next year! Even though football season is over, (just watched your video again) thanks for reminding us that the Winter Olympics begin on Friday. Another great job with this post. Love all of the memes and pics. I especially LOVE your fitness tip as I re-quote you “A defeated attitude will only bring you defeat so aim big and see what happens! You might just surprise yourself… This really tells us to never give up. Yes, the Winter Olympics are coming this Friday! What’s your favorite event? Thanks for the comment, I’m glad you enjoyed the post! Pingback: That’s Amore! – #DoubleFML FatDarrellPalooza! Def brought memories back with the parachute in gym class, man miss those days… Kids today dont know how fum gym actually is cause they no longer do things we did … Thanks for memory lane!!! Pingback: Royal Flush – #DoubleFML FatDarrellPalooza! Pingback: I Scream. You Scream. We all Scream 4 The Last Dragon…Rawr. – #DoubleFML FatDarrellPalooza! Pingback: Strawmageddon – #DoubleFML FatDarrellPalooza! Pingback: Takin’ Flight – #DoubleFML FatDarrellPalooza! Pingback: Doomsday 2018: A Phenomnomnomenal Ending. – #DoubleFML FatDarrellPalooza! Pingback: Buffering… Level Up! – #DoubleFML FatDarrellPalooza! Pingback: Merry New Year! – #DoubleFML FatDarrellPalooza! Pingback: “Boom. 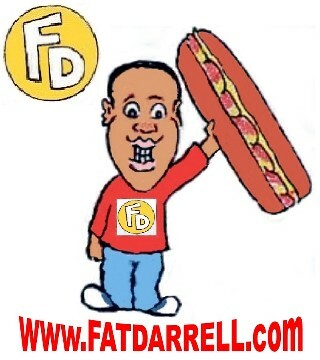 End of Story.” – #DoubleFML FatDarrellPalooza! Pingback: We Ready. – #DoubleFML FatDarrellPalooza! Pingback: Super Duper! – #DoubleFML FatDarrellPalooza!